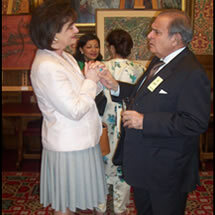 London based artist Aisha Cahn is having a preview of her artwork at the House of Lords in June 2007. 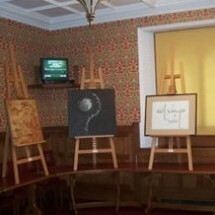 The subject of her work has created a lot of intrigue and interest in the art circle. Aisha has been inspired by the essence of existence and the nature of life that surrounds each and every one of us, and this has transpired due to her faith and belief in the Omnipresent. God, as she explains, is perceived by people of all faiths through various shapes and forms and it’s due to this perception that she has decided to express the essence of God within her work. Having read the Quran, the Bible, the Torah and various books on Hinduism, Buddhism, Sikhism and the Church of Scientology, it has become so apparent to her that God is universal and people of all faiths believe in this concept. Religion has been an intrinsic part of art for centuries from before the Egyptian civilisation, through to Islamic Art, Mughal Art, Renaissance Art (when the Christian Church had a strong influence on the Master Artists creating visual images of the Madonna and Christ, the child), to present day artists. Aisha has been studying the Arabic language for almost a decade and she uses a lot of its text in her work in particular the Kufic script. The focus of her work is the physicality of paint meeting the abstract non-representational nature of God. This is not an easy notion to paint, but because of Aisha’s ability to create the most amazing textural surfaces, using oil and mixed media, combined with Arabic text, she creates a visual dialogue within the overall composition of her work in a contemporary form. 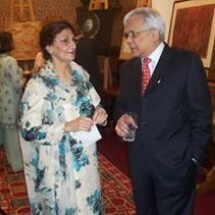 Aisha was born in Bombay, India and has lived in London for most of her life.